Denmark is located in northern Europe in the region referred to as Scandinavia. Many people may not know that Denmark is a kingdom that sits on a peninsula above the Netherlands and consists of 429 islands, including Greenland. The capital of Denmark is the famous ancient city of Copenhagen, a name that loosely translates to “Merchants’ Harbor.” It sits on the eastern coast of the island of Zealand. The city of Copenhagen was founded in the 10th century by Viking fishermen and became the capital of Denmark in the 1400s - a truly remarkable distinction in the history of Western Europe. The University of Copenhagen was founded in 1479 and is the oldest university in Denmark. Students arriving in Denmark to pursue their studies can expect to find a relaxed atmosphere among the locals. The bicycle is the predominant mode of transportation for students and native Danes alike, though public transportation is also extremely popular and very well run. The typical cityscape in Denmark is characterized by bridges, parks, promenades and waterfronts; and the architecture is a pleasant mixture of ancient and modern. Just beyond the edges of town, you will quickly find yourself in a lush forest, on a pristine beach, or visiting a small village. A clean environment is important to the people of Denmark. The country is the world-leader in renewable energy and smart waste management. Denmark consistently ranks at the top of international surveys looking for the “happiest people” in the world. The Danish ethos prioritizes work-life balance, the centrality of the family, the importance of community, and the intentional pursuit of personal goals. Freedom for the individual, and an emphasis on equality and mutual respect are core societal values in Denmark. As a student studying abroad, it will take some time to adjust to the local habits and culture in your new temporary home. While this will be challenging, it is also very rewarding. Your initial interactions with locals may strike you as reserved and quiet. But you’ll soon discover that most Danes are very approachable, kind, and happy to make a new friend. As you build new relationships, keep in mind that in Danish culture, punctuality is highly valued while spontaneity could be met with a good degree of resistance. The Danish higher education system offers a broad array of opportunities for international students, with more than 600 programs taught in English. Whether you plan to pursue an undergraduate, graduate, or professional degree, you will find plenty of options. However, unlike degree programs offered in other European countries, the diplomas awarded by Danish universities may not have a precise U.S. equivalent. It is essential that you consider your long-term goals and research thoroughly the different degree tracts. In Denmark, there are four types of institutions for higher education: Universities, University Colleges, Artistic Higher Education Institutes, and Schools of Maritime Training and Education. Before deciding on a school, you’ll need to decide whether you are pursuing your degree as a professional (“Applied”) qualification or as an academic qualification (“Research”) for continued higher education. The two-year Academy Profession (AP) programs are suitable for students wishing to enter the workforce after graduation. The three-year university Bachelor’s program prepares students with the necessary foundation for pursuing graduate-level education. The four-year Professional Bachelor’s programs are for students learning professional skills such as nursing, engineering, or computer science, and intend to enter the workforce upon graduation. For graduate students, the decision is much simpler. Universities in Denmark award one kind of Master’s diploma, the Candidatus. Upon completion of this two-year program, students are ready to enter the labor market or continue their education at the Ph.D. level. In Denmark, the standard research-based Ph.D. program takes three years to complete and requires students to engage in independent research and teaching, as well as assisting colleagues at foreign research institutions. High School Graduation Diploma + 1 year of higher education studies (e.g. college studies in relevant academic subjects) or equivalent supplementary studies. High School Graduation Diploma + 3 Advanced Placement Test within academic subjects. High School Equivalency Diploma (GED) + 1 year of higher education studies (e.g. college studies in relevant academic) or equivalent supplementary studies. High School Equivalency Diploma (GED) + 3 Advanced Placement Test within academic subjects. Certain bachelor’s programs may have additional requirements, so it’s important to check with an admissions counselor before applying. 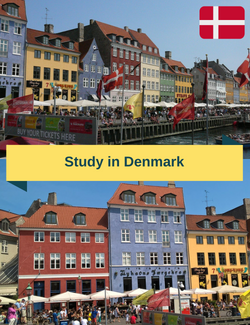 Students attending university in Denmark will find tuition rates comparable to American universities. As a full-time student, you should expect to pay $8,000 - $21,000 in annual tuition fees. However, keep in mind that a Danish degree may ultimately be less expensive than a degree earned in the United States because many programs can be completed in just two years. In addition to tuition and university fees, you will need to budget for all of your living expenses while in Denmark. But first, a word of caution: Living in Denmark is expensive. Expect to see much higher costs for accommodations, food, books and supplies, transportation (local and international), and miscellaneous fees. Students should expect to contribute a full one-third of their monthly budget to housing. Start your search early and you may be able to find accommodations outside the city or in an on-campus residence hall for about $300 per month, utilities included. Housing in Copenhagen can easily triple that amount, so chose carefully where you will study and live. Fortunately, when it comes to eating and entertainment, Denmark is very friendly to students and most businesses offer generous student discounts. With a little planning (and self-restraint) you can manage to live on a reasonable budget. If you're a student from United States, you'll need the Residence Permit to study in Denmark. Once you receive an acceptance letter from a Danish university, you are able to start the Residence Permit application. This must be submitted at least two months prior to the first day of class. The fee for the Residence Permit is about $350. Applications can be submitted online, but you will be required to schedule an in-person interview at a Danish embassy or consulate. At this meeting, you will be fingerprinted and will have your picture taken. The government will expect to see proof that you have paid in-full your tuition and fees to the university. You will also be expected to provide proof that you have available, in cash, $1,000 for every month of your program. For instance, if you are in a two-year program, you would have to have $24,000 in available funding. Expect the whole process to take about 60 days to be processed and finalized. Higher education comprises the university sector, which offers research based undergraduate and graduate programs, as well as a parallel sector for professional bachelor and diploma programs and more business oriented programmes. Most higher education institutions offer courses in English, and at a graduate level, several English programs such as MBA and MPA programs are available. Furthermore a variety of long and short programs related to specific subjects (e.g. the police academy) as well as some programs offered by the private sector (like e.g. banking) are available. For these programs, a good knowledge of Danish is required. As a starting point, you need a residence permit before arriving in Denmark. The Danish Immigration Service recommends that the application is handed in approx. 2-3 months before expected arrival. The the application should be sent to the Danish mission in the country you come from or have lived in for the last 3 months. Application forms can be obtained from the mission or the Danish Ministry of Foreign Affairs website. If there is no Danish mission in the country in question, you can contact the mission of the Schengen country, which represents Denmark.